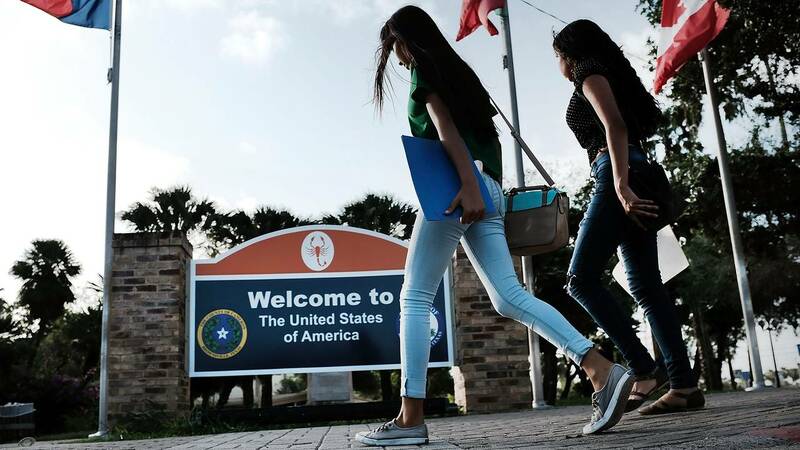 A sign welcomes people to the U.S. from Mexico on June 25, 2018 in Brownsville, Texas. (CNN) - If it feels like the US has become increasingly divided along race, gender, and other identity lines — it's because it has. A report released by the Haas Institute at the University of California-Berkeley last week found that the US has become less inclusive -- in other words, less welcoming to women, minority groups and people with disabilities -- compared to the rest of the world since 2016. What's more, inclusiveness differs significantly from state to state. To develop its inclusiveness index, the Haas Institute looked at how people who are not white, male, Christian, straight or able-bodied fare in society compared to the majority. The team gathered data on how each of those groups do across indicators like hate crimes, political representation, anti-discrimination laws, income inequality, incarceration rates and immigration and asylum policies. In 2016, the United States was one of the most inclusive countries in the world, ranking 23rd. In 2017, that ranking dropped to 69th. The US has improved some since 2017, and it's now the 58th most inclusive country, according to the Haas Institute's index. That still puts it in the medium category though, ranking behind countries like the Philippines, Poland and Nicaragua, but ahead of countries like Nigeria, Israel and India. The biggest reason the US is consistently ranked as less inclusive than countries like the Netherlands, Sweden and the United Kingdom is the number of people in the US held in prisons and jails, said Stephen Menendian, an author of the report and assistant director of the Haas Institute. The US has the highest incarceration rate of any country in the world. For every 100,000 people in the US, approximately 655 of them were behind bars, according to a 2018 report from the Bureau of Justice Statistics. Another factor dragging the US down is the Trump administration's refugee and immigration policies, according to the Haas Institute's report. "It shouldn't be surprising for people who are paying attention to the headlines," said Menendian. Since President Trump took office, his administration has dramatically scaled back the number of refugees admitted by the US, even as the number of people displaced by war and famine surges across the world. In 2019, the US will cap refugee admissions at 30,000, the lowest level since 1980. The new cap is even lower than the record low 45,000 cap in 2018. To put that number into context, the Obama administration set the cap at 110,000 refugees for the 2017 fiscal year. "The country is rolling up the welcome mat and that's reflected in the data in our index," Menendian said. If you expected to see liberal, coastal states at the top of the inclusiveness list, the rankings might surprise you. States like New York, New Jersey and Connecticut didn't make the top 10, while California only ranked number five. The most inclusive state in the US is actually Hawaii, followed by Nevada, Maryland, Vermont and California, according to the Haas Institute's index. At the bottom of the list are Louisiana, South Dakota, Texas, Oklahoma and Mississippi. Hawaii's no. 1 ranking has a lot to do with its racial diversity. Seventy-five percent of people in Hawaii are non-white or biracial. Colleen Hanabusa and Tulsi Gabbard, the state's representatives in the US House, are both women of color, and Sen. Mazie Hirono is of Japanese descent. It also has the country's highest percentage of nonwhite state legislators. "If you think about Hawaii, which has a very multiethnic population, I'd say that the report accurately captures the degree to which people of various different ethnic origins are participating in the economy," said Camille Busette, a senior fellow for the Brookings Institution. "That suggests inclusivity." Meanwhile, the five least inclusive states have all enacted anti-Sharia laws, an indicator that the Haas Institute used to predict discrimination against all religious minorities. The Haas Institute illustrated how inclusiveness changes from state to state through a number of real-world examples, including access to clean water and sewage services; gender-equality laws; and the enforcement of controversial immigration laws, such as family separations. The report's findings may seem grim, but the situation isn't hopeless. In 2018, more states (12) became more inclusive than became less inclusive (11). Meanwhile, 27 stayed the same. Menendian said the US ranks in the middle on political representation of minorities, and the 2018 data doesn't take into account the results of the midterm elections. The report also isn't all encompassing. Busette points out that the Haas Institute didn't touch on other important markers of exclusivity, such as food insecurity. "Internationally, we know that food insecurity has been a problem, but in the US, food insecurity is also a problem and depending on where you are, it's more of a problem than not," she said. Busette added that inclusiveness is probably best measured at the neighborhood level. But she said the index could offer a more holistic picture of how inclusive states are if it also took into account factors like housing insecurity, healthcare insecurity and wealth disparity. "The report focuses on income disparities, but not wealth disparities," she said. "Wealth disparities tell you about the historical legacy of the lack of inclusion, the multi-generational policies that make it difficult for a particular group to generate wealth." Menendian cautioned that the index shouldn't be viewed as the end-all-be-all on how inclusive a country or state is. "Our index is a good diagnostic instrument for trying to get a sense of how countries are faring and how states are faring against each other, but it's not the final word on these issues," he said. Lastly, the report doesn't account for recent political developments that would presumably benefit a country's inclusiveness ranking. For example, a record number of women were elected to the US House of Representatives in November. Native American women and Muslim women were elected to Congress for the first time. Colorado elected an openly gay governor, and a number of other states experienced similar historic firsts.